my dearest, How are you today?, my name is Ashley Jobe. I am 24 years old girl 5'8 "tall from Gambia in West Africa. I am presently residing in the refugee camp here in Dakar Senegal with my younger brother Kumba as a result of the political crisis which happened in our country that lead to a (10) ten years imprisonment of my beloved father Baba Jobe My father Baba Jobe is the chairman of the leading party (APRC) of the president Dr. Alh.A.J.J Jammeh of the republic of Gambia, West Africa. I and my younger brother are the only surviving soul of my imprisonment father. We managed to make my way to a nearby country Senegal where we are now living as refugees in order to secure our life since we don't have any other alternative. Please i will like to know more about you, your likes and dislikes and what you are doing presently for a living now. I will tell you more about myself in my next mail. Attached here is me and my brothers picture. Waiting for your reply as soon as possible. Hello my love How are you today? I believe you are doing fine, i am more than happy in your reply. mine is a little bit hot over here in Dakar Senegal. Its just like one staying in the prison, i hope by Gods grace we will come out here soon. I don't have any relatives now whom i can go to, the only person i have now is Rev.John Mark who is the pastor of the (Christ for all Churches) here in the camp. He has been very nice to us since we came here, but we are not living with him rather, we are leaving in the hostel because the camp have two hostels one for men the other for women. The Pastors Tel number is (+221-778-794-087). If you call, tell him that you want to speak with Miss Ashley Jobe he will send for me in the hostel. As a refugee here we don't have any right or privilege to any thing be it money or whatever because it is against the law of this country. I speak English language, and hold a certificate in general school of Nursing at Bakou institutional planning the Gambiai. I am the only daughter of BABA JOBE chairman of the leading party (APRC) of president Dr. Alh.A.J.J Jammeh of the Republic of the Gambia, West Africa, with hope you have read/heard from CNN how the president Jammeh arranged a special commission lead by Justice MA Paul and Sentence my Father who have been his best friend (BABA JOBE JOOF) 10 years imprisonment since last five years at Mile 2 prison Banjul, the Gambian capital. This commission and the president have leveled an allegation against my father for embezzling the Gambian Government fund (thirty million Dalasis equivalent to $15M (fifteen million us dollars.). It is not true, because their is no proof against that. Some prominent Men and presidents in Africa who are very close and good friends of my Dad with other top business men in Africa such as Grema Mohamed and Benco. West Africa (Plc) came to Gambia with cash to pay the amount the Government is claiming from my Father, all their efforts to the release of my father was in vain because they were warned by the president of our country Gambia to keep off from the case until he co-ordinate with the UN United Nation and seized all the whole wealth's of my father both our houses, cars etc. Please listen to this, it has being four months back ago that i visited my Dad in the prison, then he told me about a bad dream he had concerning his life here in the prison. He also reviewed a secret to me about our last hope ($6.7m) six million seven hundred thousand Dollars, which he deposited in a Bank in Europe that he used the name of my younger Brother Kumba as the next of kin for security reasons. He instructed me to leave our country Gambia with my younger brother together with his necessary documents since my Mother Mrs IDA JOBE has died after suffering from high blood pressure on 6Th February 2006 and left only me and my younger brother Kumba. I decided to run to the refugees camp here in Dakar Senegal where i am presently seeking asylum under the United Nations of Refugees commission with my younger brother Kumba. I wish to contact you personally for a long term relationship that may lead us to a better place in the future if we can congregate in the same proximity with truth confidence and sincerity. My father instructed me on how to get the money that he deposited in Standard Chartered Bank in London (SCB) out from the bank, that i should look for a foreign partner outside the country that will assist me and my younger brother to get the money transferred to his account on our behalf, the person will help us to invest the money in a good business in his country or outside his country. Lastly the person will take care of me and my younger brother Kumba. I kept this secret to people in the camp here the only person that knows about it is the Reverend, because he is like a father to me. So in the light of its all, i will like you to keep it to yourself and don't tell it to anyone for i am afraid of loosing my life, that of my younger brother and the money if people gets to know about it. Remember i am giving you all this information due to the trust i deposed on you, meanwhile i will like you to call me like i said i have allot to tell you. Subject: darling thank you for your willingness to help us. My love and my hope, Good day from the camp, how are you today together with YOUR family over there?, hope God is in control of everything?. I thank you for your love, care and confidence to me and my brother not minding our refugees status, God bless and reward you for us. My love, we are living like one in the prison with allot of sufferings, without good food, good water to drink, good medical care, good shelter, even good cloths to wear, and every other things that you can think of for a good and a normal way of living. Our life here have been full of misery. My dear, you are all we have in this world now, after reading your mail, it gave me courage, i was touched by my spirit that both of us are meant for each other, i can not resist my love and heart of trust to you, i love you from my inner heart. I will sincerely be there for you in every condition and situation that we find ourselves. Your family is mine if you will really be there for us with your heart of love. I am given you all full 100% assurance that i will always be yours forever as long as i live in this life. My love, i have contacted the bank about my intention for the release and transfer of this money, the bank said that we can't transfer this money on our own, then they instructed us to look for a foreign partner who will stand on our behalf in this transfer due to our refugees status, this money will be transferred to the persons account on our behalf. Presently with me here in the camp is all my fathers bank files which i will send to you as soon as the bank needed them from us concerning this transfer. My dear, please i have some important questions which have been disturbing me, and i will like you to answer all of them from your inner most heart before i will introduce you to the bank for them to know that you are our life and foreign partner whom i have chosen to stand for me and my brother kumba's behalf in this transfer. Please i will like to know from your heart if you will really help us to retrieve this money from the bank without any betrayal ?. I will like to know if you will not betray me and my brother after the money is being transferred to your account on our behalf ?. I will like to know if you will really help us to invest this money in a good and profitable business in your country once the money is being transferred to your account ?. 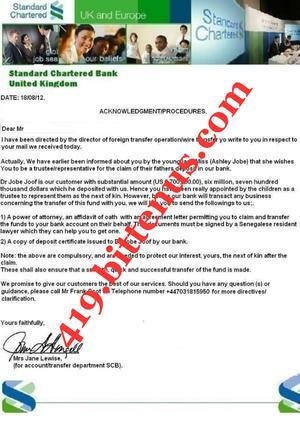 I will like to know if you will really send us money to get our traveling documents so as to come over to meet you over there in your country as soon as the money is being transferred to your account ?. I will like to know if you will really be there for me forever as long as we live together as one ?. so that i will send them to the bank and get you introduce to them as our foreign partner that is helping us to transfer this money to his account on our behalf due to our refugees status. My Darling. How are you today?. I believe that you are doing well. As for us, we are fine a bit here with all hopes to meet with you immediately after the transfer of our money to your position for a better life. God will bless and reward you for every effort you are about to make to see us out from this horrible prison called refugees camp where we are living today as a result of the imprisonment of our beloved father. I appreciated your interest to assist us to transfer the money deposited by our father at STANDARD CHARTERED BANK OF LONDON of which the name of my younger brother Kumba appears as the next of kin. This place is like a prison as we are only allowed to go out on Mondays and Fridays of the week, i thank God for the life of the Pastor of the church that is located in the camp where i send and receive emails. I chosen you immediately i saw your profile in the site without delay because they said that out of hundred, there must be a good Samaritan, i hope that it was by God's grace that i choose you. During my prayers, God reveal to me that you are a very kind person that is capable to help us, i have 100% trust and confidence in you, i am rest assured that you will surely help us out from this terrible place called refugees camp. ACCOUNT NAME IS BABA JOBE JOOF. Already i have inform this bank about our intention to claim our fathers deposit of which the name of my younger brother Kumba appears as the next of kin. The only thing the bank told me is to look for a foreign partner who will assist us in this transfer due to our refugee status here in Senegal. As a refugee we are resisted to a direct claim of the money, the transfer can only be done with the help of an appointed representative as the united refugee law governing refugee all over the world states. Write to Mr Frank Scot the foreign transfer officer of the bank telling him that you are our representative and that you want to assist us transfer my 6.7 million dollars deposited by our beloved father of which the name of my younger brother Kumba appears as the next of kin, i have equally forwarded your contact details and information's to them regarding this transfer. When the transfer is being done, you will now send us some money for us to come over to your country. Please contact the Bank today for the transfer and get back to me, i will be expecting your reply and call soon. Subject: RE: FROM THE ACCOUNT/TRANSFER DEPARTMENT SCB LONDON. please open this attachment and get back to us as soon as possible. your mail WI .. cllved loday. Actually, We haYI urlier bun informed Ibout you by the young ladyMi .. (Aohl.yJob.) that .h. wi$h ..
You to bl a tru.tellflP"Un1a􀁳vl lor Ih. claim 01 thlir lo1hor$ dopoort in our ban􀃻. thounnd dolla .. which he depo.nodwith uo. Heneoyou h ... bo.n really appoint.d by the children ""
tru.t .. 10 ,.p .... nt Ih.m I. the n.x! of kh Howlver. before our bank will tr.n .. ct .ny bu.ine ..
concerning the Inn. 'er 01 this fund w􀃼h you, Wo will lik. you 10 o.nd the lollowing. to u",. lawyer which they can help youto get on •. 2) A copy 01 deposit ce","cOIllllued 10 Or Job. Jool by our bank. guidon". pion. call Mr Frank Seot On Tolophone numbo, +447031815950 lor more dlre"H".. ! (for .«oUnllt .. n,l.r deplrtment SCB). Hello my love, how are you today?, hope that you are feeling fine. Darling, i am more than happy to hear a good news from you that you have contacted the bank and have also receive a reply from them. I don't know how to thank you for what you have done for us by giving us hope when it seems that all hope for our future and freedom have gone. As am writing to you, is as if we are right there with you now since we have gotten a reply from the bank concerning this transfer. 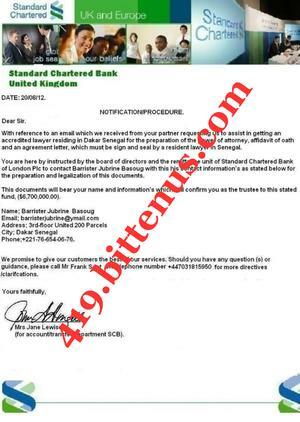 I have seen what the bank request from us before transferring our money to your account on our behalf. As i told you earlier, i have my beloved fathers file which includes the deposit certificate here with me in the camp. What we need now is the power of attorney, affidavit of oath and an agreement letter which the bank said will be the things that will permit you to stand on our behalf as our foreign partner or trustee in this transfer. I wrote a mail to the bank in London to know if they can help us to look for a good and competent lawyer here in Dakar Senegal, who will assist us to get the power of attorney and affidavit of oath and an agreement letter being demanded by the bank for the transfer. If the bank give me a contact of any good and reputable lawyer here in Dakar Senegal, i will give it to you for you to contact him for the preparation of the power of attorney, affidavit of oath and agreement letter on our behalf with regards to the transfer of the money to your account. I am assuring you that you are not going to regret any thing you did on our behalf as far as this transfer and our present condition is concern because we are going to depend on you alone in managing the money for the future when the transfer is being done. Subject: Re: CONTACT THIS ACCREDITED LAWYER. please open this attachment for the information's of an accredited lawyer from Senegal. and In ag. .e menlldler. which must bo .llIn and .ul by a , ..I dont lawver In Sonogal. th. p,eparation and I.gali,olion olltll. docum.nt •. Add, ... : 3,d.floo, Unned 200 Pa,cel. P ho no: + 221 ·76-ll5HI6· 76.
, ;:;􀀈;;;;-:􀀉 (for occountllrlnof.r deportment SCe). My darling, How are you today?, i know that you are well and good for me. Darling am getting better because you are there for us. god will bless and reward you for every effort you are making to see us out of this horrible situation that we found our self today as a result of the imprisonment of our beloved Father, with all hopes that you will assist us to transfer this money to your position for a better life with you. I appreciate the way you are handling the transfer of our money to your position and in your own account pending our arrival to meet you so that we will start a new life with you. Darling we are suffering here in this prison called refugees camp and i believe with god and you by our side we can start a new life in your country after the transfer of our money to your account. I have seen what the bank is demanding before they will transfer our money to your position. Presently, i have my fathers file which include his deposit slip with me here in the camp. The problem we have now is the power of attorney, agreement letter and affidavit of oath certificate which the bank said that it will be issued by a lawyer here in Senegal for me to sign my signature on it. My dear as i told you that i wrote to the bank for them to assist us in getting a good lawyer from Dakar Senegal since we are living in the refugees camp without having freedom of our own in order to seek for a good lawyer that will help us in preparing this documents the bank demanded from us before this transfer can be done. SEQUEL TO YOUR EMAIL LETTER WHICH WE RECEIVED TODAY IN MY NOBLE LAW FIRM ON HOW TO PREPARE AN AFFIDAVIT OATH, A POWER OF ATTORNEY WITH AN AGREEMENT LETTER IN YOUR NAME FOR YOU TO STAND ON BEHALF OF YOUR PARTNERS MISS ASHLEY AND MASTER KUMBA JOBE, WHICH WILL ENABLE YOU TO STAND ON THEIR BEHALF AS A TRUSTEE/REPRESENTATIVE IN THIS TRANSFER FROM THE STANDARD CHARTERED BANK LONDON TO INTO YOUR ACCOUNT IN YOUR COUNTRY. I WILL PROCEED TO THE FEDERAL HIGH COURT HERE IN DAKAR SENEGAL TOMORROW MORNING TO ASCERTAIN THE COST OF THIS DOCUMENTS AND HOW LONG IT WILL TAKE TO BE PREPARED AND LEGALIZE FOR IT TO BECOME VALID AT THE HIGH COURT AND NOTARY PUBLIC OFFICE RESPECTIVELY. ONCE I RETURN FROM THE HIGH COURT, I WILL UPDATE YOU ON THE COST OF THIS DOCUMENTS NEEDED BY YOU AND YOUR PARTNERS IN THE REFUGEES CAMP HERE IN DAKAR SENEGAL AND WHEN THIS DOCUMENTS WILL BE READY. ENCLOSE WITH MY FULL IDENTIFICATION IN THE ATTACHMENT. NOTE: MY PRIORITY IS TO RENDER THE BEST SERVICES TO MY CLIENTS. FOR MORE INFORMATION YOU ARE FREE TO CONTACT THIS HONORABLE LAW FIRM FOR GUIDANCE. Hello my darling, how are you today?, hope all is fine. We are extremely happy for the interest you have been showing to us not minding our refugees status. Despite that, we are not feeling fine here in this refugees camp, is as if we are in the prison yard or a semi hell fire, if am to explain the condition of this place, but i strongly believe that we will be out of this prison called refugees camp soon. I realize how important it is for us to meet in person one day in the nearest future. Though, this is the time for us to know each other so that we can share our dreams, thoughts and every other thing about us together, from their our love and relationship will grow up with many other things that is around us. Some people don't have a good experience and a possible means of finding the right partner for a better life, whom they can have trust and confidence as well. Thank God that we met each other at the right moment and time. We must try our best to achieve our goals and ambitions too. I know that we would communicate with each other as more often as possible which is the best and the only way to know the truth between us. Is not easy to find a true love, however, i hope i could trust you by telling you everything that we want to share with you in common without hiding our feelings to you. I need a real love from a real man that knows what it is for some one to be in love, who knows that love is bond between two people of like minds that are ready to congregate in the same proximity in life so as to share everything together in common, to be feeling for each other not minding the distance, nationality, color and religion, to have a Godly spirit, to be caring for each other in every way, to be optimistic in life, to have a helping and a Charity spirit, one who is not extravagant, one who is hardworking, one whom we can rely on to manage this our money and live a better life in the future, and many other good attributes. Meanwhile, thank you for contacting the lawyer for this documents, that are delaying this transfer now. Please once you get a reply from the lawyer, let me know so that we will know when the documents will be ready for us to submit it to the bank regarding this transfer. Hope to hear and receive a good news from you soon. Subject: RE: FROM MY HONORABLE LAW FIRM. SEQUEL TO YOUR EMAIL ON HOW TO PREPARE A POWER OF ATTORNEY, AFFIDAVIT OF OATH WITH AN AGREEMENT LETTER FOR YOU AND YOUR PARTNERS IN THE REFUGEES CAMP HERE IN DAKAR SENEGAL. PRIOR TO MY INQUIRIES TODAY AT THE FEDERAL HIGH COURT AND NOTARY PUBLIC OFFICE CONCERNING THE COST OF THE LEGALIZATION OF THIS DOCUMENTS BEFORE IT BECOMES VALID. FROM MY INQUIRIES TODAY AT THE FEDERAL HIGH COURT AND NOTARY OFFICE, THE MAGISTRATE SAID THAT THIS DOCUMENTS WILL BE READY IN TWO WORKING DAYS TIME FROM THE DAY WE APPLIED AND PAID FOR IT, WHICH I BOOKED AN APPOINTMENT WITH THEM TODAY. THE DRAFTING AND AUTHENTICATION OF THIS DOCUMENTS AT THE HIGH COURT IS $630. FOR NOTARY STAMP AT THE NOTARY PUBLIC OFFICE IS $565. THE LEGALIZATION OF THIS DOCUMENTS FOR IT TO BECOME VALID AT THE HIGH COURT IS $635. WITH MY LEGAL PROCESSING FEE OF $200. WHICH IS A TOTAL SUM OF ($2030 USD). My dearest in Mind, How are you today?, hope your fine and better than us here in camp. Dearest, i received a forwarded message from the lawyer which i forwarded to you, i can see the lawyer is demanding for some money to get the documents for us. Dearest i am a refugee, i don't even have money to eat or take care of myself, life is very hard for me, i am surviving by grace of god, sometimes we eat here in the camp, sometimes we starve,life is extremely difficult here in the camp. Dearest, i don't know whom to ask for any money to cover the lawyer's expenses. Please, i need your help to get the documents from the lawyer, i will pay back immediately our fathers deposit is transferred to your Bank account and will compensate you enough for your love and support. I really needs you most at this point in time,as you can see the bank has accepted you as our trustee and ready to transfer the deposit immediately we present their requirement. Please, don't break my heart now that i have trusted so much in you, i have dream so much about staying out of my present condition for a better life with someone like you who really loves me. I promise to be love you with all my heart and give you everything you need from a woman, My love for you is true and i believe you are the right man for me. Please help me take care of the lawyer's expenses it shall be the greatest thing that will happen to my life to hear that you have gotten the needed documents from the lawyer on my behalf. I am looking up to you and you alone, once again thank you so much for your efforts so far and take good care of yourself for me. Hope to hear a good news from you in your next mail. All my hopes and dreams is up-to you. Hello my love, How are you today?, hope you are feeling fine for me. I just read your mail, darling you're all we have in this world please do not abandon us over here to die, we need your help more than any other to now. I called the lawyer after reading your mail and asked him to help us to prepare the document that we will pay him back as soon as the transfer is done, so he made me to understand that the money he asking us to pay will be use to legalize the documents before it become valid, he said that there is no way the chief judge will legalize the document without him paying the money first so he said that he advice us to look for the money. Sweet heart as you can see now the bank is ready to transfer the money into your account as soon as we provide the documents they demanded from us am on my knees now begging and crying unto you for help please look for a way to get the money, if you can borrow please do after the transfer we will pay the person even with an interest. I want you to reply and let me know the amount you have at hand now then i will go back to the lawyer and tell him that this amount we can afford for the moment, i believe he will help if we can come up with some thing, so reply and let me know the amount of money you have hand. i will be waiting to hear from you soon.